The nose of the aircraft as seen inside the building. 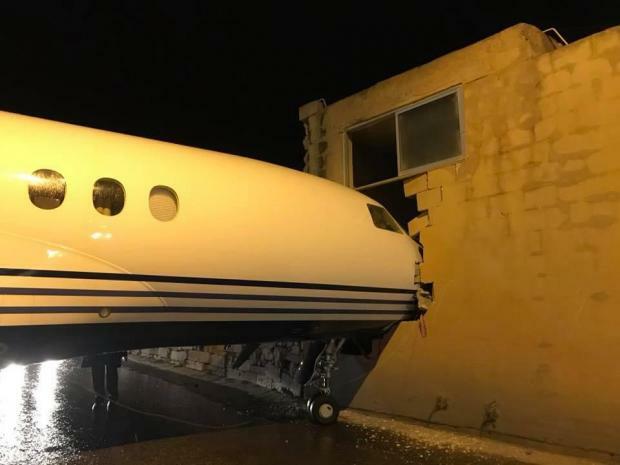 An aircraft was blown off the airport apron on Wednesday night, ploughing through a perimeter fence and into the road before crashing into a building. No injuries were reported at the incident in Ħal-Farruġ. Officials believe the strong winds forced the unmanned plane from its wheel chocks, pushing it into the road before crashing into the building owned by the Polidano Group. "It seems like it was the result of the strong winds. 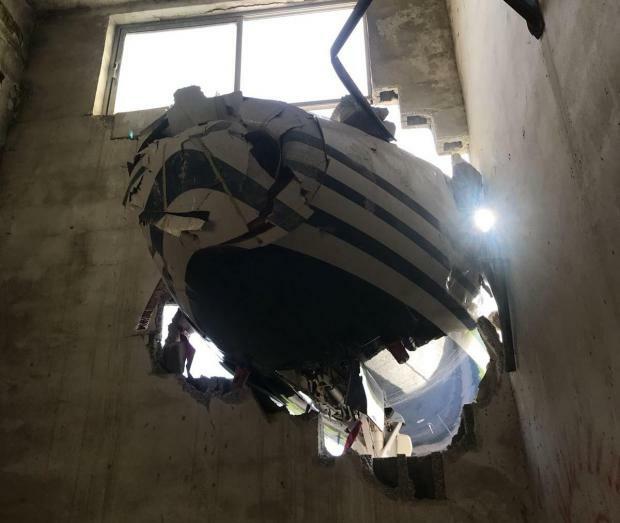 The building didn't sustain major damage, but we presume the aircraft did," Polidano Group's legal representative Jean Paul Sammut told Times of Malta, after he was informed about the incident through airport security. Nobody was present in the building at the time of impact. The privately-owned Dassualt Falcon 7X was parked on Apron 4, close to the Lufthansa Technik facility. 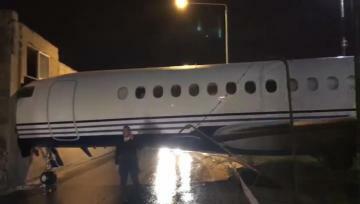 According to some reports, the private jet belongs to British politician and businessman Lord Michael Ashcroft. He is a former deputy chairman of the Conservative Party. 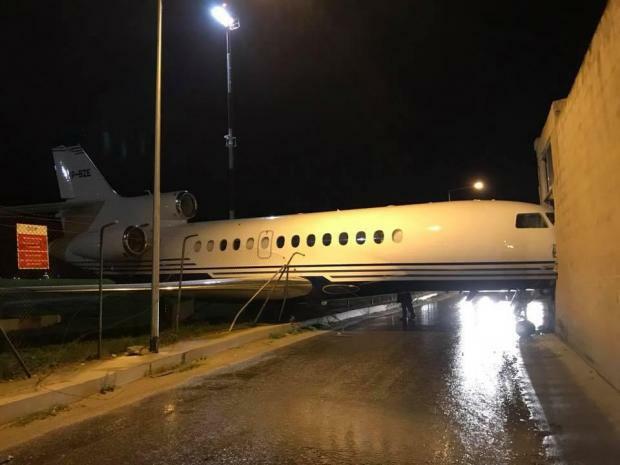 Transport Malta and Malta International Airport officials are investigating the incident, while the Bureau of Air Accident Investigation are also investigating. The police and armed forces were on site and closed the road off to traffic. In a statement, MIA said its operations and security teams were deployed to the scene immediately to safeguard the integrity of the aerodrome and secure the airport perimeter. MIA's Rescue and Fire Fighting Services were also on the scene as a precautionary measure, however there were no injuries reported. MIA said on Thursday morning that the aircraft was parked on Apron 4, which area is primarily used for the parking of civil aircraft for maintenance or general aviation. However, it did not reply to questions about how the aircraft was tethered or by whom, saying: "Malta international Airport is supporting the Bureau for Air Accident Investigation in its ongoing inquiry and therefore it would be premature to give any further details at this time. The airport’s Rescue and Fire Fighting Services also remain on standby should any special assistance be required." In the evening, a spokeswoman for MIA said aircraft specialists were on site to assess the damage and give the airport recommendations on how to proceed.